This video says it all… who I am, what I do and how I can help you! Thank You Carrie for the video!!! I’m about to be a bride in the fall and I was thinking about bridal beauty. We brides need to be prepared for anything. Make sure you have your maid/matron of honor has these simple yet handy items ready and waiting for you! 1. Tissues, cotton balls, cotton swabs. Smudges happen! 2. Bobby pins for your updo! 4. Eye drops…for those red eyes! 5. Hand cream – for photographs of your soft, beautiful hands. 6. Hand sanitizer – you’re gonna be shaking a lot of them…need I say more? 7. Lip gloss, liner, stick AND balm. 8. Double-sided tape – you may have slippage you didn’t notice before! 9. Nail polish – in case of any chips or smudges. 11. Toothbrush and toothpaste – to freshen up after dinner if need be, garlic or onions in the salad maybe? And how about those little picks for in between teeth…essential! 12. Folding hairbrush with mirror – this tiny compact can be a lifesaver. 13. Deodorant wipes-you may never hug as many people as you do on this day, so smell fresh without fear of white residue! 14. Breath Freshener-you may never kiss/hug as many people as you do on this day! 17. 1 or 2 pair of hose. Runs happen! You heard it here first. 18. Clear nail polish. See 17. 19. Needle and thread sewing kit. 20. Travel size can of hairspray. 21. Headache medicine. Of the stress! 22. A small pair of scissors. 23. Safety pins in different sizes. 24. Small first aid kit. 25. A Detergent pen- like the Tide pen. 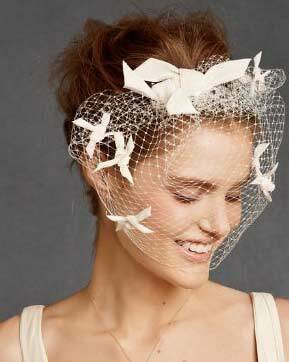 This does work if the brides or bridal party’s dresses gets anything on it. These are the essentials that are needed if there is an “Oh My God!” moment. If you are interested in makeup application, please visit my website www.skinchicinc.com and contact me personally! I mentioned in my last blog that “I want to embrace change. It might appear scary at first but I know that with that change I will grow as a person. I WILL embrace it. I have felt for a while now that I have been in a rut and I am looking forward to this change.” I guess I’m still in this rut. I have been so preoccupied with starting a new employment position at Nucci Medical Clinic, my About FACE radio show, Directing About BEAUTY networking group, getting my new Web site up and running, and everything else in between. 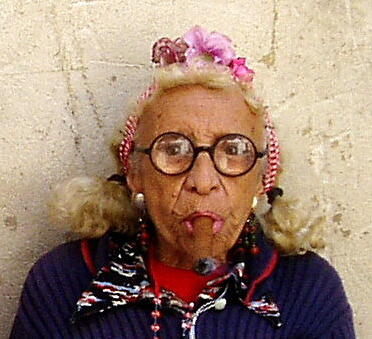 My point is that the reason I am in a rut is because I am preoccupied with life. We all have time to do what we would like to do, we just have to make the time! If I am to do this project, I don’t want to half a$$ it. I really want to do a realy great job; not only for me, but for you my reader. “Using This Book” there are a few things I am going to need: A Journal, Index Cards, My Favorite Pen, Old Magazines, Colored Pencils, a Poster Board, Scissors, Thumbtacks, the Website www.michellephillips.com and lastly a special storage spot like a basket or a drawer. All check! I realize this book is an eight-step process. For every step there will be written exercises. This will create a plan for your life, looks, and teach me how to find ongoing support to turn this plan into reality. Every chapter Michelle has thrown in some facts and exercises, as well as some powerful affirmations to recite. 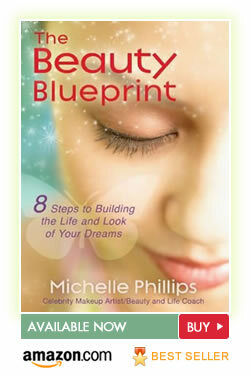 By step 8, Michelle says that I will have a wonderfully new, vibrant perspective on my real beauty. I start this project with anticipation and excitement! I hope you join me in this new plan!!! Minerals, Liquid and Talc, Oh My! In my previous blog, ‘So many lines, so little time’ I wrote about how to specifically decipher between all the lines out there in skincare land. I next thought about all the makeup lines an all the choices of specific foundations to choose from. I wanted to break down all the formulations out there for you in order to choose the right one out there for you and your clients. Are you confused on which is the right for you? Do you even know the difference between mineral, talc or liquids? Do you know that there are different levels or grades of products out there? If your confused then this blog is for you. Minerals: Minerals are bio-inert. Bio-inert means that there isn’t a chemical or physical reaction between the skin and the makeup. Minerals and pigments are micro-pulverized using proprietary technology into microscopic flat particles. These particles overlap each other on the skin to allow the skin to breath and function properly while filtering out airborne pollutants. There is great staying power to minerals that rarely need touch ups throughout the day. Chemical free, preservative free and the pharmaceutical grade minerals are TALC FREE!!! The minerals are also smear proof and water resistant. Minerals have buildable coverage as well. Minerals are great for concealing so you don’t need another product. It is your liquid, power and concealer all in one. 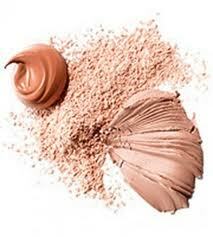 Liquids: Liquid foundations have a liquid lotion base and pigments added for color and coverage. 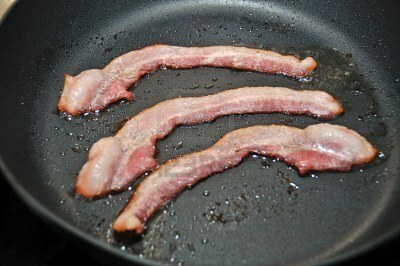 Many have chemicals, preservatives and parabins. Tinted moisturizer– It is a lotion and pigments combined, 80% lotion and 20% pigment. VERY sheer coverage. Tinted moisturizer is perfect for softening and protecting the skin while adding a hint of foundation color. This makeup is also ideal because you don’t have to put on moisturizer and then foundation, it’s a one step process. 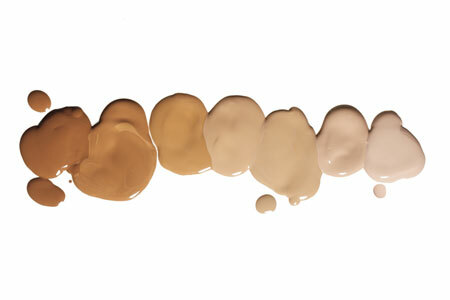 Liquid Foundation– 40% lotion and 60% pigments. MOST airbrush makeup utilizes a liquid foundation however, they add water so the spray won’t get clogged. This is great for easy application, personally I think it’s a fad. It may look cool but the makeup artist must carry the machine which might be cumbersome. Women with oily skin should avoid dewy finish foundation and should set any liquid foundation with a translucent powder to reduce shine. Whipped Foundation– This is a liquid foundation that has been whipped with air. Mousse makeup is liquid makeup with air whipped in making it lighter and smoother. It comes in a spray or aerosol-type can, like whipped cream. It costs more than other cosmetics because you’re paying for the added air and specialized packaging but if you’ve ever spread whipped butter on a hot piece of toast then you’ll know the difference is vast. Whipped foundation is good for all skin types. Talc: Talc is a mineral produced by the mining of talc rocks and then processed by crushing, drying and milling. Processing eliminates a number of trace minerals from the talc but does not separate minute fibers which are very similar to asbestos. Talc is toxic and talc particles can cause tumors in human ovaries and lungs. Numerous studies have shown a strong link between frequent use of talc in the female genital area and ovarian cancer. Talc particles are able to move through the reproductive system and become embedded in the lining of the ovary. Clearly with or without asbestos-like fibers, cosmetic grade talcum powder is a carcinogen. I don’t mean to scare you about talc, as you probably gathered I am just not a fan of the stuff. 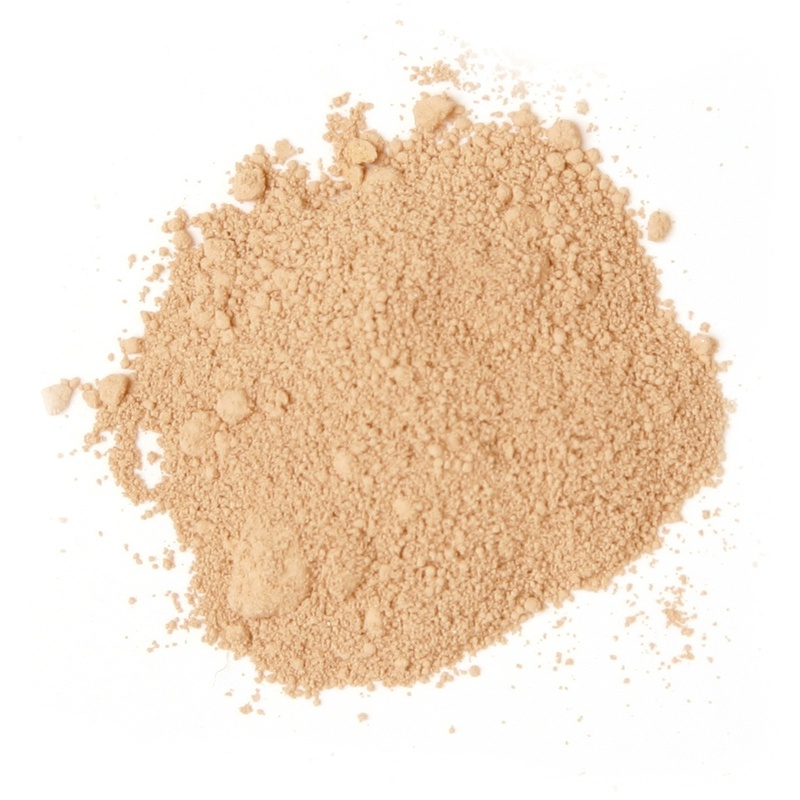 I have been pro minerals ever since 1996 when I was a sales representative with Jane Iredale. What I encourage you to do is be astute to the products you are going to personally use and the products you are going to use for your clients. Read labels, study the new technology, do your homework. I also would like to encourage you to try all the forms of makeup out on yourself. If you love a product yourself you will always be better at selling it. Go to your makeup bag, empty it, go through it and then start to throw liquid items away if they are more than 3 months old. Now you have made a start.